We have just returned from our 2019 tour to Cambodia and witnessed many wonderful things Jesus has done in the lives of so many people. People have been saved and healed and hundreds have received anti parasite medication and vitamins. We have distributed school supplies food and personal hygiene items to school children in the northern province of Kratie approximately 250 kms north east of the capital Phnom Penh where we spent 2 days. On the 2nd day in this very poor area, we visited a small village to hand out the medicine and pray for the ill and injured. While distributing de-worming medication and vitamins at the village chief’s house, and offering healing prayer for anyone who was ill or injured a mother asked for prayer for her arm which was ‘frozen’ and she couldn’t lift it at all. The team prayed for her and then asked her to test it out. She was reluctant to do so as it had been so painful to move it at all. So with a little encouragement she began to lift it further and further and then swung it around like a ‘swimmer waiting to dive into a pool for the 50m freestyle’. It had been totally healed! She then asked if the team could come and pray for her son who was unable to walk. A young man perhaps in his early 20’s had been very ill for a month with dengue fever and malaria. He was lying in the verandah totally weak and unable to walk without assistance. His family had taken him to Vietnam to try and seek some treatment however there was no change. 3 of the team went to his house and prayed for him. There was little or no change to his condition. However on leaving we encouraged this Buddhist family to say “thank you Jesus for healing our son” each morning and night. While travelling back to Phnom Penh on the bus (5.5hours) his father called to say the young man had got up and had a shower and his strength was returning! He also said he wanted to learn more about this Jesus the team had told him about. What a mighty miracle working Lord! All glory and praise to Him for healing this young man - truly a great day in the Kingdom. We were also able to build some desks for one of the schools, fix some plumbing problems at the pre-school and sort out hundreds of items that had been donated to Cambodian Care and tidied the store room accordingly. So it was a very productive trip with a wonderfully dedicated team. There were simply too many testimonies of healing to post here but we’ve included a few highlights below. We visited a church on an island in the Mekong and distributed medicine there. We offered prayer for anyone who was ill or injured. The lady shown in this photo had asked for prayer when we visited this village the year before. She was close to death and was told she only had a short time to live. We prayed for her last year. Two days after we left the village last year she was totally better. It was SO great to see her this year fit and well and very thankful for her healing. 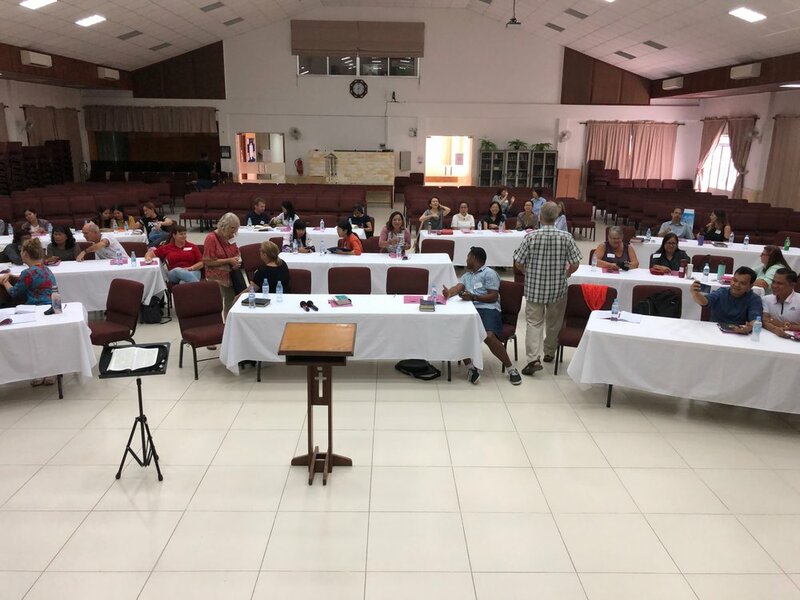 We conducted a 2 day Healing School at the International Christian Assembly in Phnom Penh prior to the full team arriving (see photos below). It was a very fruitful time with approximately 50 people attending many of whom experienced the healing of pain and sickness in their bodies as they practiced praying for each other on the second day of the school. We taught on the Biblical Basis for healing, Hindrances to Healing, the Anointing and taught a simple model for them to use in praying for the sick. Here is a testimony from 2 people who attended the school and then put into practice what they had learned in the 2 day school. “Our apartment building has a security man that we have seen every day for three months. One of his legs is substantially shorter than the other and we’ve been wanting to pray for him for months! He only speaks Khmer (Cambodian); is shy; and we were pretty confident that he would be very uncomfortable if we tried to pray for him. Then we took a 2-day Healing Prayer workshop and our faith grew immensely as we heard accounts of physical healing. After practicing in the workshop, we were ready to pray for our doorman. Our faith was overflowing! Here are some additional photos from the 2019 tour. HERE ARE JUST A FEW OF THE MANY TESTIMONIES OF HEALING FROM THE TRIP. A lady with cold and headache healed. A female with breathing difficulty and stomach pain healed as hand laid on shoulder. A lady with headache healed. A lady with painful swollen knees healed. 3 ladies with headaches healed. A man with knee and shoulder pain healed after he reported feeling coldness go through painful parts as we prayed. 5 People were prayed for at the school in Kratie province (5.5 hrs north of Phnom Penh). 1. Man with painful knees and numbness in right leg. Healed. 2. Woman with painful knees and elbows healed. 3. Woman with painful stomach and wrist healed. 4. Woman with sciatica pain in right leg healed. 5. Woman with painful wrists healed. Prayed twice for each person before complete healing. A lady told the team both knees were painful. Right knee had loss of cartilage. Left had excess bone (calcification). Both knees were pain free after prayer! A lady we encountered had been medically diagnosed with HIV AIDS with pain all over. She felt like she had a large ball (tumour?) in her abdomen. After prayer she was pain free and no longer had the "ball" in her abdomen. One of the village leaders near the school in Kratie province had back pain and leg/knee pain. After prayer he felt a bit better. We then prayed again for Jesus to heal his back. He said all pain gone. He said he felt numb in his leg. We prayed for his leg and he said it felt better. We prayed a forth time and he said all pain gone. He invited us to come back the next day to his village to distribute de-worming medication and vitamins and pray for the sick there. The testimony above relating to the young man with Dengue fever and Malaria came as a result of us returning to this village at his invitation. God had a plan all along!